Achieve HR Excellence. Become a CPHR. As a human resources (HR) professional, you are a leader in your field. Employers, colleagues and clients turn to you for strategic advice, clear guidance, and leadership on all aspects of HR. Make the most of your HR knowledge and experience, and get started on the path towards the Chartered Professional in Human Resources (CPHR) designation - the gold standard of HR professionals. 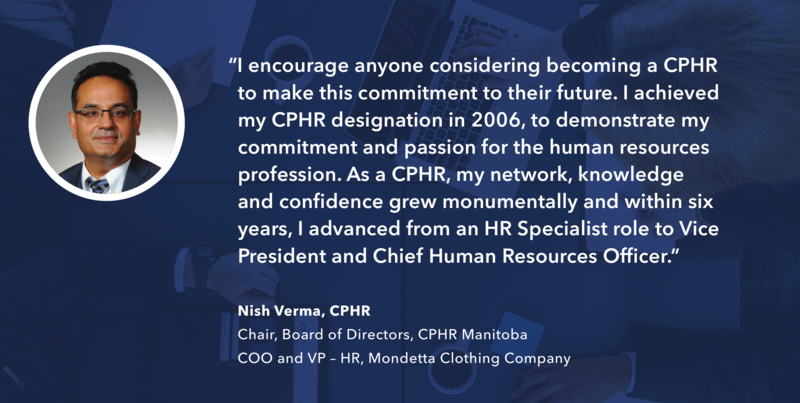 Granted provincially, CPHR Manitoba is the sole certifying body in Manitoba for the nationally recognized Chartered Professional in Human Resources (CPHR) designation. The CPHR designation, pronounced C-P-H-R (each letter is said individually), represents a commitment to a national standard of excellence and sets a benchmark for the practice of effective Human Resources. It emphasizes the strategic role of HR management in business and plays an important role in securing HR's position as an equal business partner at the executive table. The CPHR designation signifies that an individual has achieved and continues to actively demonstrate mastery of the CPHR Competency Framework. Through a national examination and assessment process, each CPHR designate must demonstrate the core competencies relevant to the HR profession. 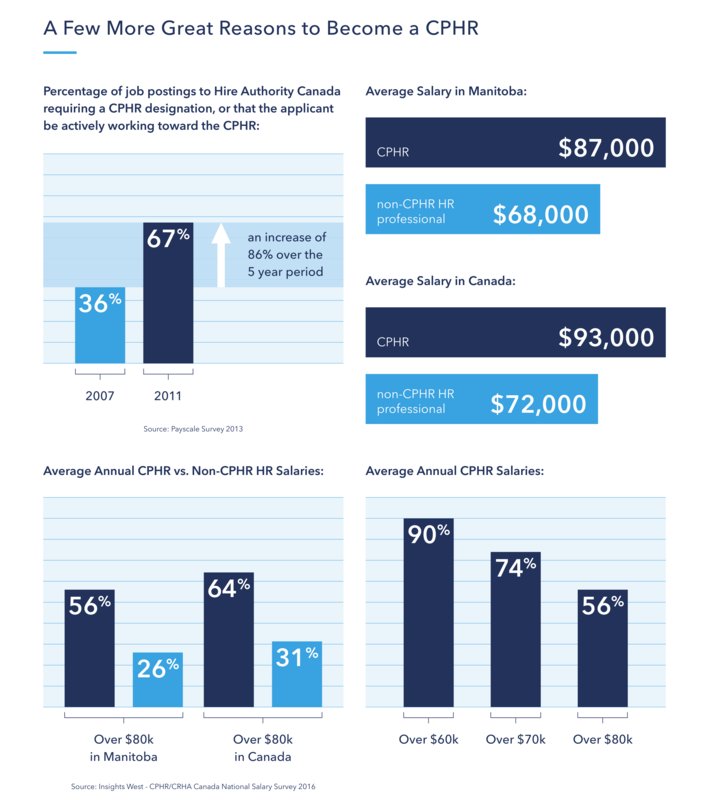 The CPHR designation can enhance your career opportunities and compensation potential. An increasing number of organizations require or prefer that successful candidates for HR positions hold, or are working towards obtaining, the CPHR designation. This is particularly true for senior HR positions. The designation is recognized across North America and assures employers, clients and other HR professionals that a CPHR has committed to abide by the CPHR Code of Ethics and Rules of Professional Conduct (the CPHR Code). If you choose to move to another province, territory or state and practice HR, you can transfer your designation. For more information about transferring and maintaining your CPHR designation, click here. The CPHR education, examination and experience requirements are designed to provide candidates opportunities to develop and demonstrate the required CPHR competencies. Maintain active membership with CPHR Manitoba. Membership benefits, categories and fees can be found here. Demonstrate theoretical knowledge of the Functional Knowledge Areas by passing the National Knowledge Exam or graduating from an Accredited Post Secondary Institution. Demonstrate application of the functional competencies and enabling competencies through the Validation of Professional-level Work Experience, practicing human resources, where the depth of work performed requires independence of action, responsibility for outcomes and influence with decision makers. Certification is an essential tool for maintaining high performance standards. The CPHR designation assures employers, clients and other HR professionals that a CPHR has committed to abide by a professional Code of Ethics & Rules of Professional Conduct, a breach of which will result in disciplinary action including the possible removal of the designation. Click on the chart above for detailed information about the requirements for each path. Members who have passed the National Knowledge Exam or who have successfully applied for an NKE waiver and have not yet completed the Validation of Professional Experience (VPE) will be granted the ability to use “CPHR Candidate” as a professional title. The CPHR is valued by the employment community and the ability to be officially recognized as a CPHR Candidate will provide you with additional recognition. You may use this title in resumes, business cards, emails, LinkedIn or any other public profiles. CPHR Candidates must maintain a membership with CPHR Manitoba. Failure to comply will result in the revoking of your membership. Upon successful completion of all requirements for one of the routes, a CPHR Certificate will be issued. As a CPHR, you represent the standard of quality in human resources practice in Manitoba and Canada. Advance and expand your professional knowledge and practice across the competency areas, throughout your career, by meeting the Continuing Professional Development (CPD) requirements each year. Adhere to the CPHR Code of Ethics & Rules of Professional Conduct. Maintain a membership with your provincial association. With CPHR Manitoba, annual renewal is required by May 31st each year. For the most current information, click here.